No one seems to know what exactly washed ashore on Seabrook Island this week, but it certainly has many guessing. 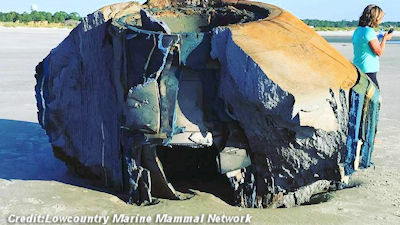 The large cylindrical shaped discovery was featured in a Facebook post by Lowcountry Marine Mammal Network. Dozens of people commented on the post. Many people posited that the seemingly out-of-this-world item could be a UFO. Other, more grounded posters, considered the possibility that it could be a broken part of a satellite or possibly a buoy.